We work directly from CAD files, as well as common 2D drawings. How should 3D CAD data be submitted? 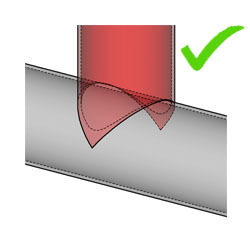 The best method for submitting cad data is via the STEP format. Whether the design was done in Solidworks, Pro-E/Creo, Catia or any other CAD system, exporting to a STEP file is generally the most reliable approach, as it is an ISO standard format. If your system does not export STEP data, let us know what you're using and we'll find a solution. You can send an assembly file that contains individual tubes as parts, or you can send a part file containing individual tubes as part-bodies. Given one or more STEP files, required material, and required quantity we can provide a quote and do the actual cutting. Miterworks has developed custom software to automate everything, so there is no need to separate the individual tubes or do any kind of manipulation after the design work is done. The bodies that make up each tube should be trimmed so that they don't interfere with one another as shown below. The actual profiled tubes will look like the middle illustration after cutting, but the software will handle either of the first two types of geometry. Generally it's easiest to trim the CAD bodies as shown in the illustration on the left. 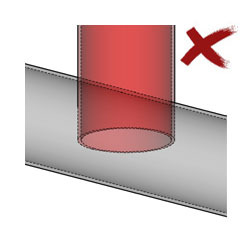 If a 3D cad file is being used to request a quote or place an order, remember to insure that all tubes are included in the assembly, and to remove any non-tubes or other bodies that you don't intend to have us cut. It's especially helpful to have each tube labeled at the time of machining when an assembly contains a large number of parts. To provide meaningful part numbers for labeling, you can apply a part number to each body in a part file, or use part numbers as filenames when using separate part files for each tube in an assembly. 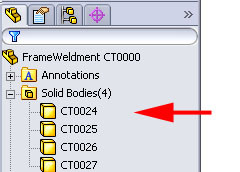 This is where bodies can be named in the Solidworks FeatureManager .